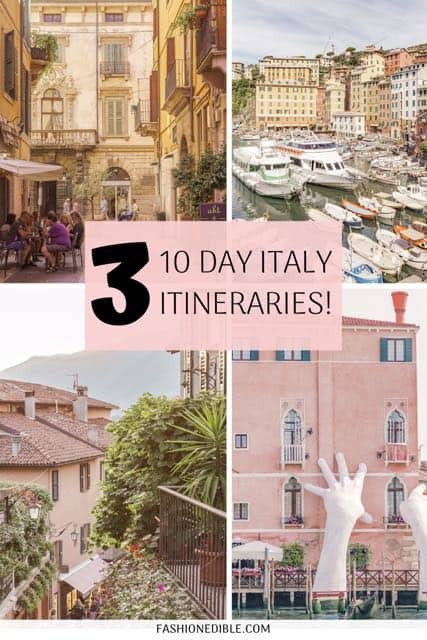 We’ve been to Italy three times and still feel like we haven’t seen it all so I’m sure you can already guess that a 10 day Italy itinerary will really only give you a tiny peek into all that this beautiful country has to offer. You might be wondering what time of year is best to visit. While you can easily visit year round, spring, summer and fall are the best times to travel to Italy. Winter can be cold, wet and some places in the smaller villages close down during winter months. However, low season also means less crowds and less chaos; remember that the most popular cities will still be open and running year round and that the mountainous areas of Italy will be perfect for a winter vacation. Simply put, Italy is the best. 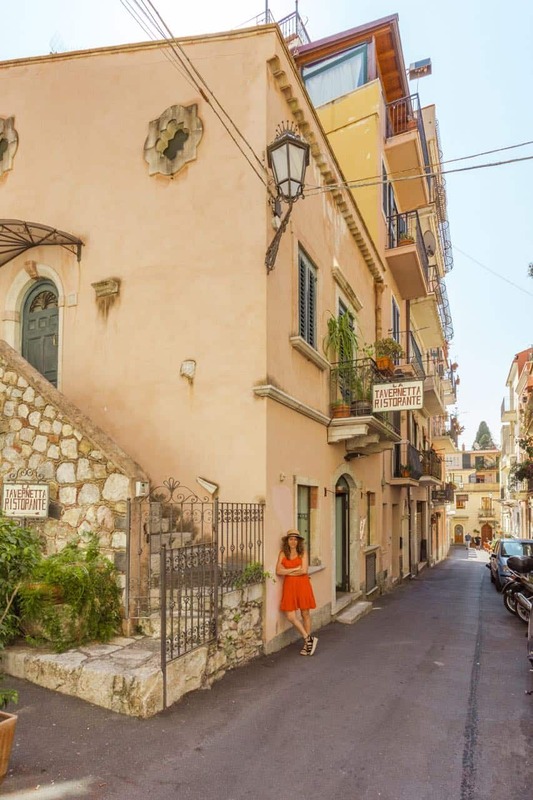 Not only is Italy the site of 4 major world renowned ( and touristy) cities but it also boasts quite a few smaller destinations that are worth putting on your radar. Italy also claims several islands, all of which have their own unique charm, as well as a handful of lakes. We’ve put together a few Italy itineraries to choose from for your next trip to Italy and while you can mix and match destinations according to your preferences, pay close attention to the distances between each place. We’ve tried to separate the itineraries out by region so as to reduce travel time as much as possible. 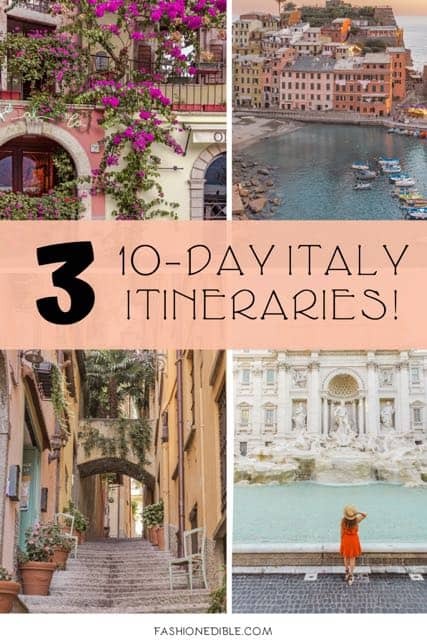 Ideally, we would recommend visiting Italy for two weeks and then either extending a day to each city and/or adding an extra place to your itinerary. 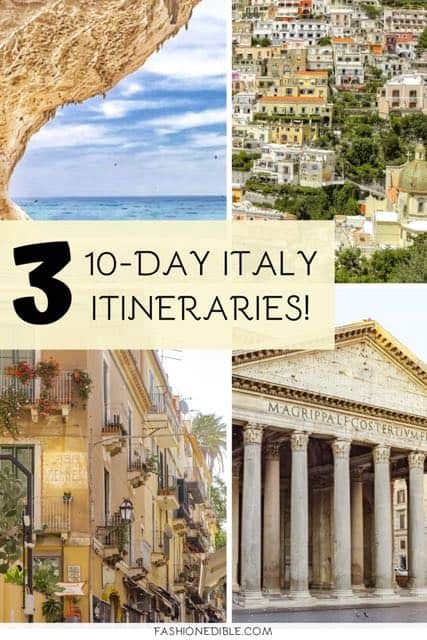 Of course, if that’s not possible, you’ll still be able to enjoy Italy in 10 days and it gives you a great excuse to keep coming back as we do! 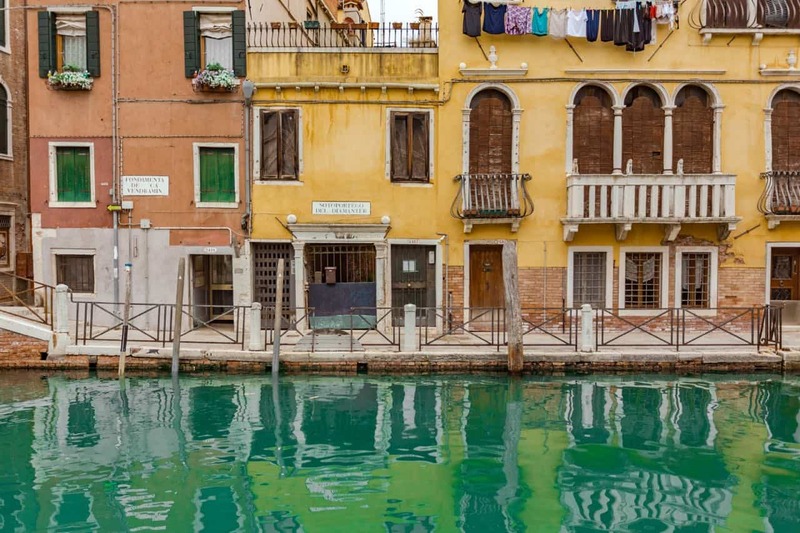 Check out our guide to the most beautiful places in Italy as well as these best European itineraries if you have more time and are considering adding other European countries to your trip. We would highly recommend this Italy travel itinerary to everyone but especially to any first time visitors to the country. All of the major romantic cities are included as well as two coastal destinations. If you choose to visit for two weeks instead, you can add extra days to the Amalfi Coast, Rome, Naples or Venice and/or add 3 days in Sardinia. The map below gives you an idea of the general region covered by this itinerary. Start your 10 days in Italy with one of the major cities as they are cheaper to fly into (Rome, Florence or Venice but most likely Rome). Amalfi Coast – Everyone loves the Amalfi Coast and that’s because there’s nothing quite like it in all of Europe. The coast is made up of 22 small towns or villages; the most famous is Positano and as such, we would recommend using the Positano area as your base. 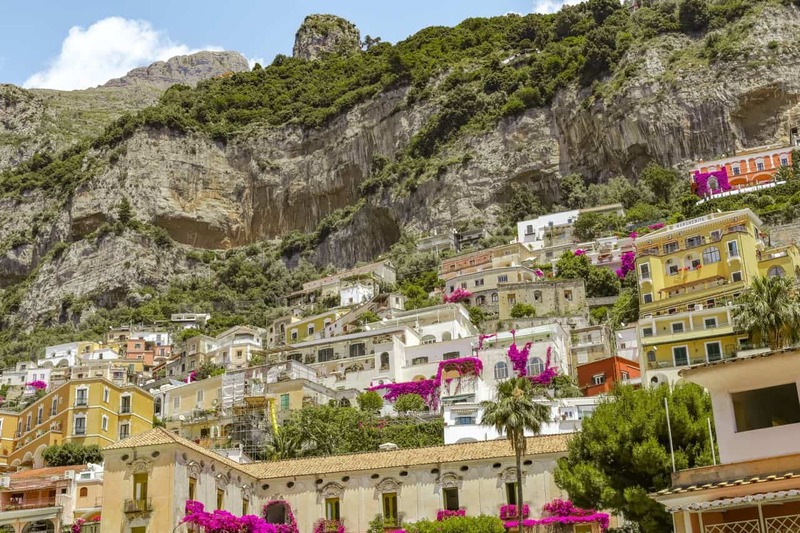 You can opt for a quieter Positano vacation by staying in Nocelle (a town on the outskirts of Positano) or you can fully embrace the crowds by booking a hotel in Positano itself. Most people choose to stay in town as that’s all part of the charm. If you’re into hiking, you can hike the Path of the Gods from Nocelle to Praiano and then spend the evening in Praiano to witness the sunset. Alternatively, you can visit some of the other towns, especially Amalfi, Atrani and Ravello. Naples – Naples region is the perfect base to explore the surrounding islands including Capri, Ischia and Procida or nearby town of Pompeii. You could spend a day exploring Naples and eating all of its famous pizza and then use day 2 to explore Ischia. 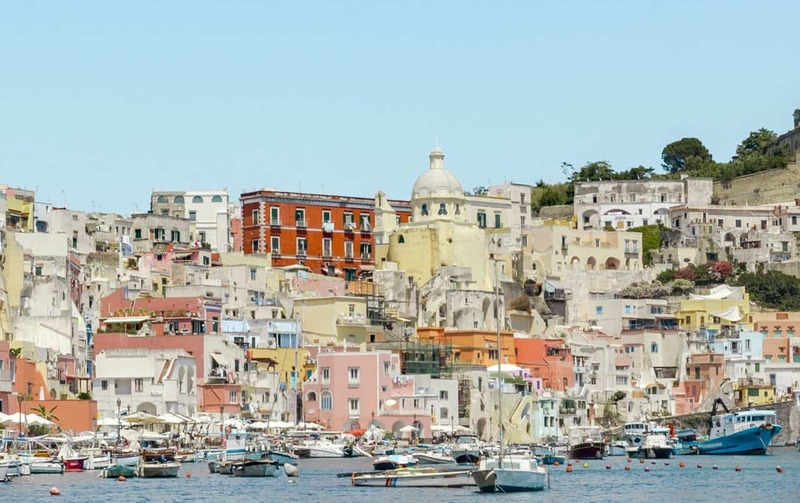 Alternatively, you could stay in Ischia and divide out your two days between Ischia and Procida. 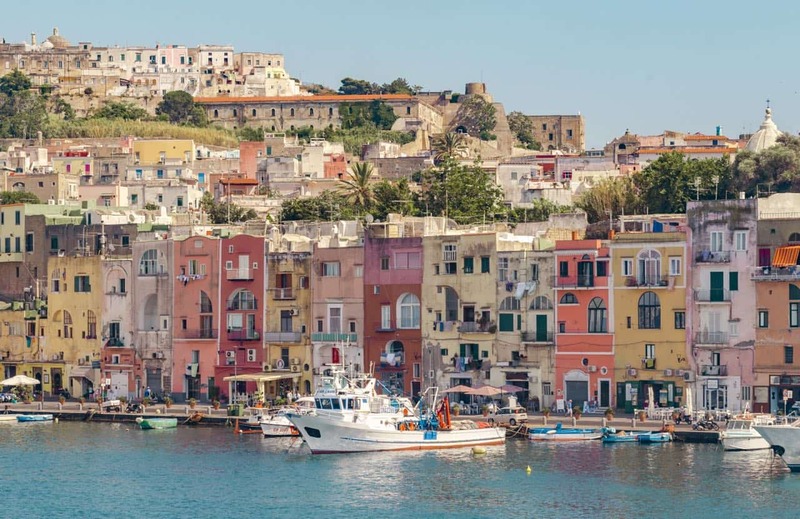 Ischia is around 18 square miles while Procida comes in at around 2 square miles. The difference in size is pretty drastic so plan for more time spent on Ischia. 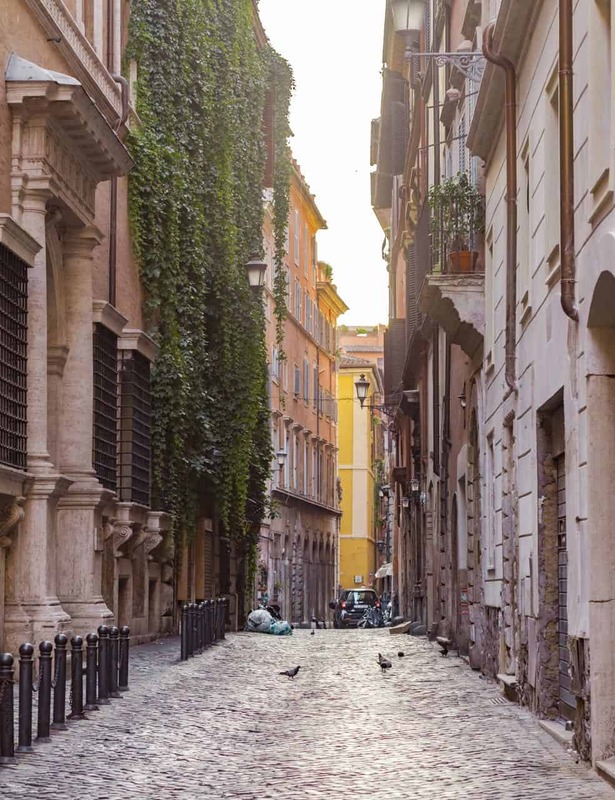 Rome – Many people look down on Rome and scoff at its crowds but we think it’s one of the best places in Italy. 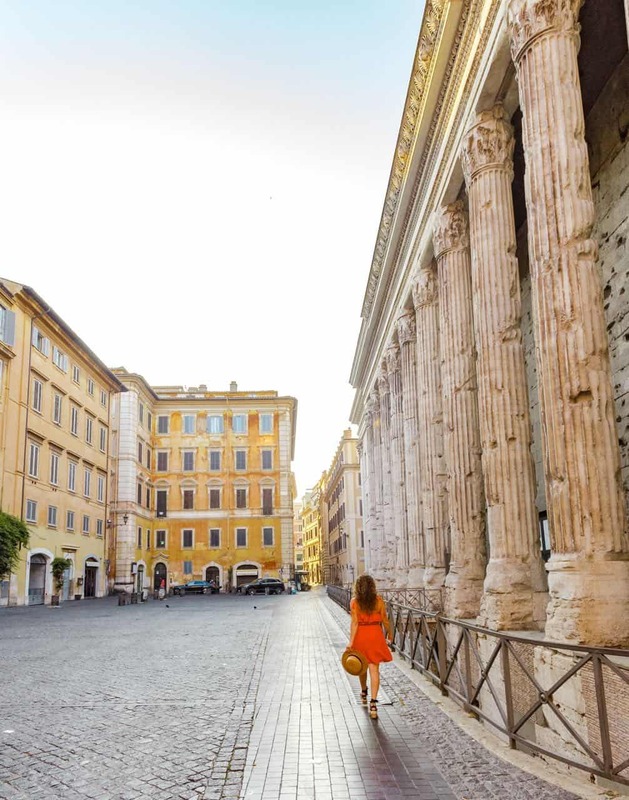 Sure the crowds are high during the mid-day rush but if you can manage to wake up early, around sunrise, you’ll be able to experience a Rome that not many other people take advantage of. 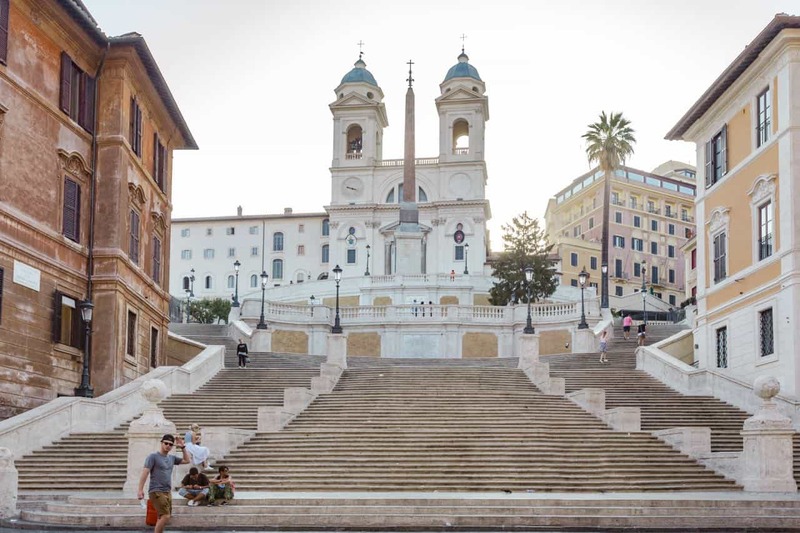 We would recommend avoiding the Trevi Fountain, Spanish Steps and Pantheon during the middle of the day but would instead suggest visiting them around 7 am. You’ll have each site almost entirely to yourself. For ticket-based attractions like the Vatican, the Sistine Chapel and Colosseum, be sure to book in advance. Florence – Ideally, you’ll spend one day in Florence and one day in Tuscany in order to get a better feel for this art-centric region. 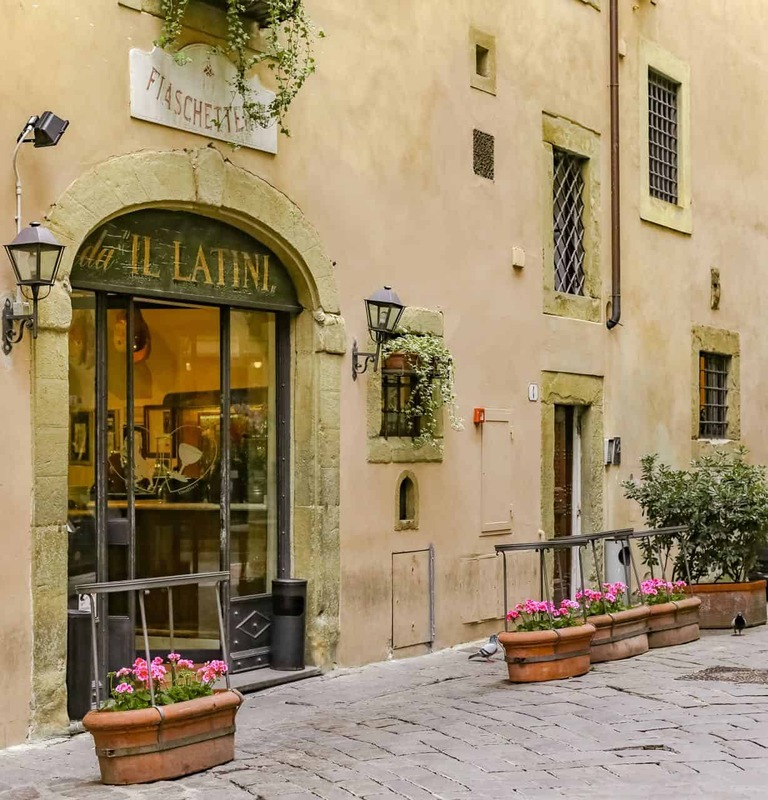 You could easily spend 4 days between the two as there are many small towns in Tuscany that are worth visiting (ex: San Gimignano or Siena) but since a 10 day Italy itinerary doesn’t allow much time in each location, you’ll have to enjoy an abbreviated version. 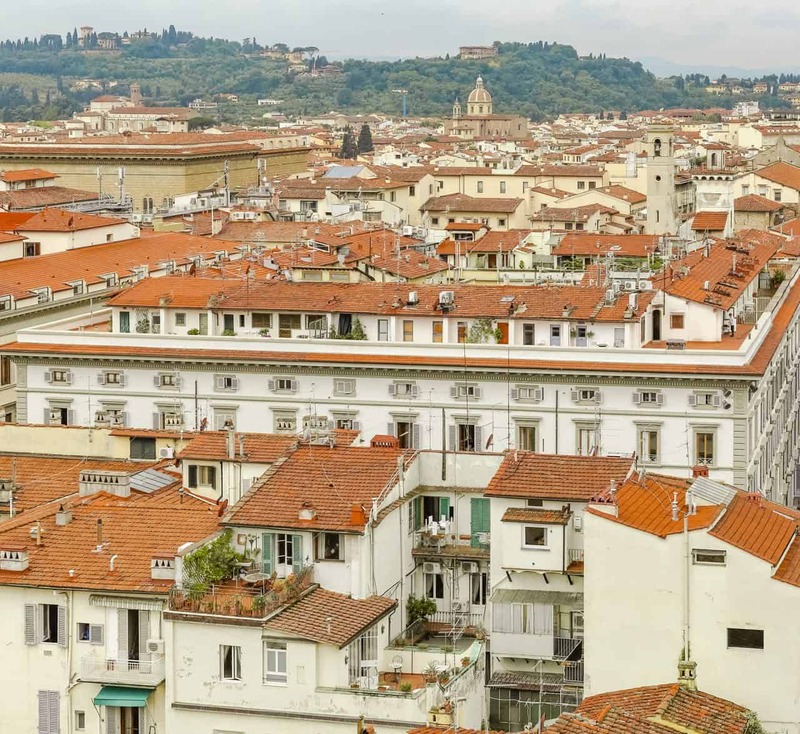 Florence is full of history and art so you can choose from seeing the Duomo, climb the Campanile di Giotto for awesome city views, walking over to Ponte Vecchio to admire local art or visiting David’s sculpture of Michaelangelo in the Accademia Gallery museum. Similar to Rome, Florence has many beautiful churches that you can just walk into (except during mass); sometimes they house exceptional works of art and architecture. Venice – Venice never gets old and your two days will fly by. Consider spending both days in Venice exploring the alleyways and canals. If you want to do everything touristy, plan to visit St Mark’s Basilica and the Doge’s Palace. But if you just want to see the popular spots that are free then venture out early. Just like Rome, Venice’s famous spots are best viewed during the early morning hours. Head over to Rialto Bridge, the Grand Canal and San Marco’s Square where you’ll be met with few people and no crowds. During the middle of the day you can explore the back alleyways or opt for a day trip to Murano or Burano. Your 10 days in Italy will most likely start in Milan, even though it isn’t on our list of destinations. This is because Milan is the best airport to fly into for this trip and tends to be the cheapest especially if you’re flying in from the USA. We would recommend a car rental for this itinerary. Enjoy a mixture of lakes, sea views and some of the best food that Italy has to offer. Your travels will take you through a beautiful blend of touristy and traditional spots. If you opt for a two week Italian trip, there are several options to extend your trip: Portofino, Lago di Braies, Turin or additional days in any of the places below. Camogli – Camogli is located in the Genoa region and is a small beach town with stunning scenery and sea views. There are several restaurants worth going to along the coast each offering views over the ocean and delicious seafood. 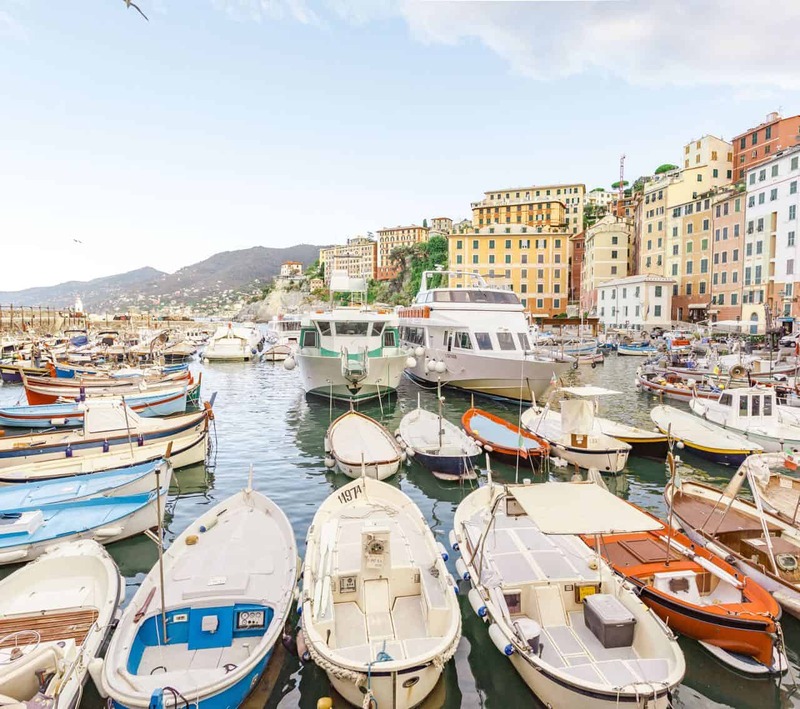 Camogli is a great base for exploring Portofino and the city of Genoa. 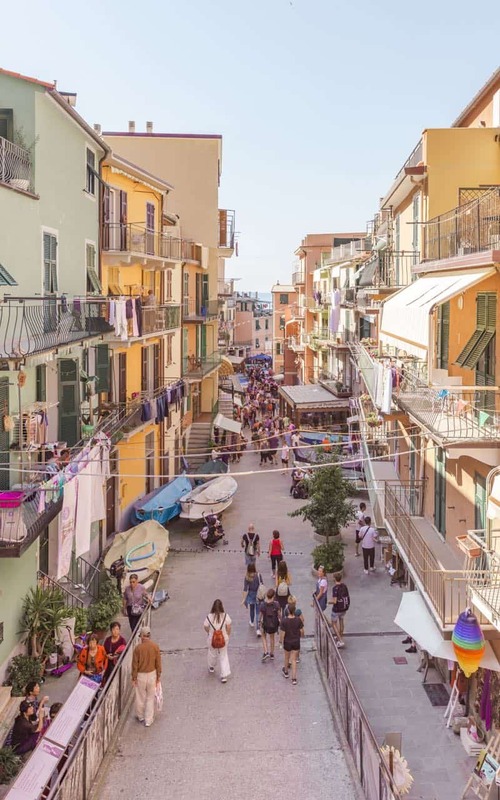 Cinque Terre – Composed of 5 towns, Cinque Terre is an unforgettable destination that we recommend for this Italy travel itinerary. You may be wondering why we’ve only allotted one night/two days and that’s because Cinque Terre is easy to do in a short amount of time. If you need more time, you can choose to stay an extra night here and just spend less time in Camogli. 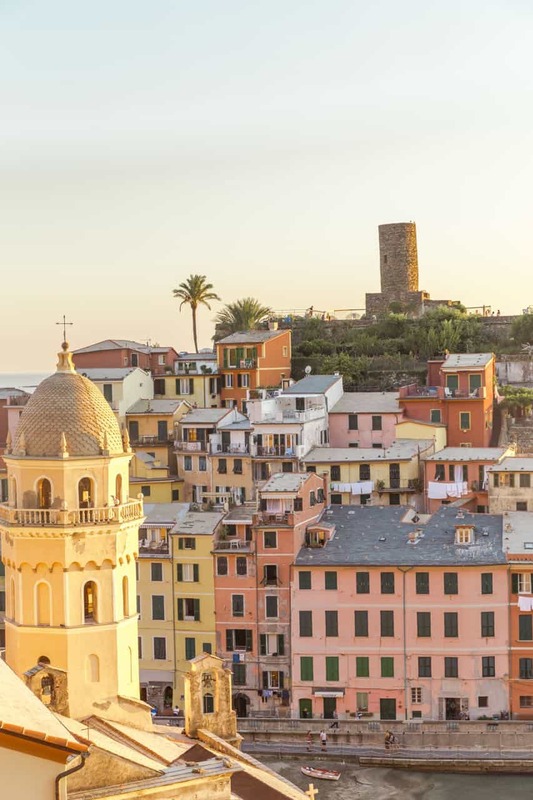 Stay overnight in Vernazza and make your way from town to town. The trains between each village run frequently and the distances between each generally are only 5-10 minutes. Try to plan your visit to see sunrise and sunset in either Vernazza or Riomaggiore. 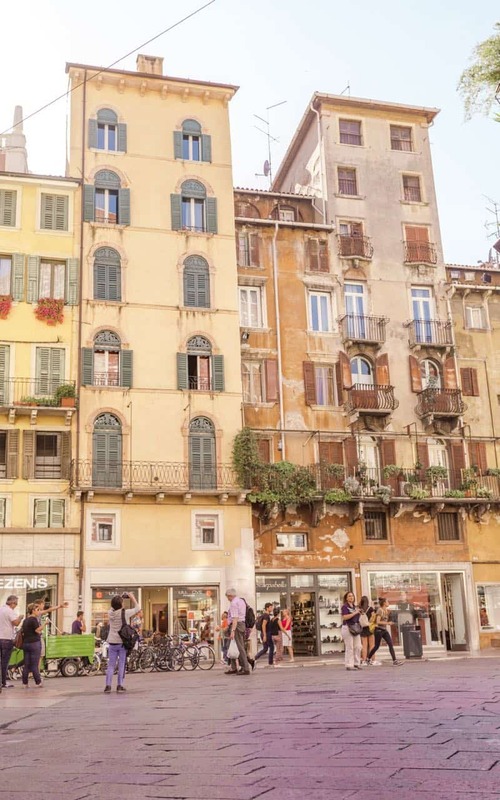 Verona – This is one of our favorite Italian cities for food and you’ll want to make sure you eat your fill of homemade pasta, risotto and burrata here. 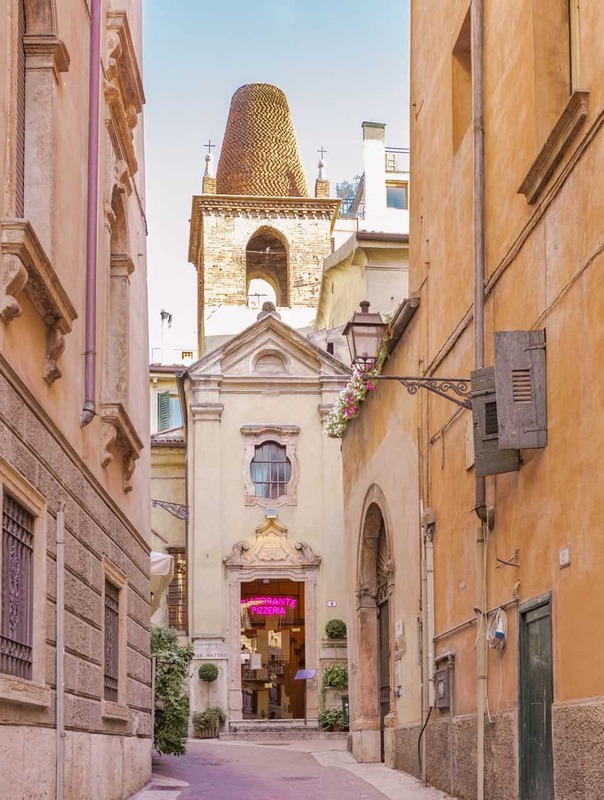 Explore Verona at least a day; if you’re wondering why there’s a huge crowd of people hovered in a nondescript side street, they’re probably lined up to see Juliet’s balcony. Consider day trips to the less touristy yet booming Parma and the equally wonderful Bologna. Lake Garda – Lake Garda is lined with charming towns and villages. 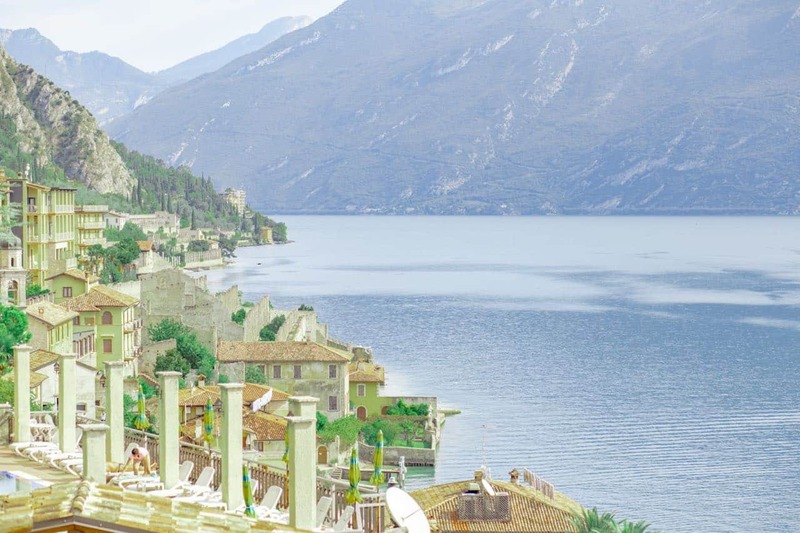 While we have first-hand experience staying in Limone Sul Garda, you really can’t go wrong with any of the lake towns. Limone sports a lemon museum, beautiful sunset and sunrise views over the lake and a dramatic mountainous backdrop. Sirmione is another fantastic town with thermal baths and a photogenic medieval castle. Consider spending a day to drive around the entire lake to visit the towns of Torbole, Riva, Malcesine and Desenzano. The drive itself takes several hours so plan to see 2-3 places that day. Lake Como – Lake Garda’s better known sister, Lake Como is where the famous city of Bellagio is located. 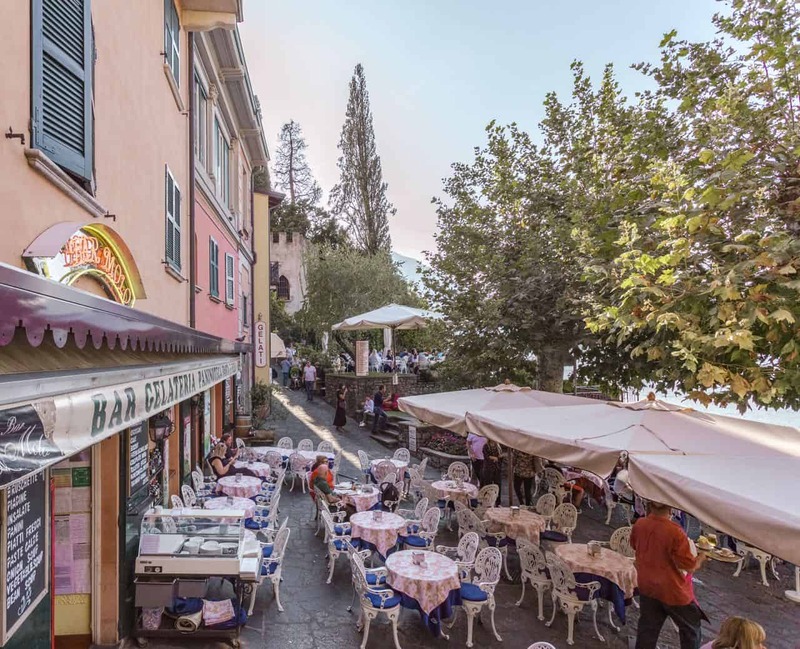 A short ferry ride away is the town of Varenna which we would recommend for your overnight stay. 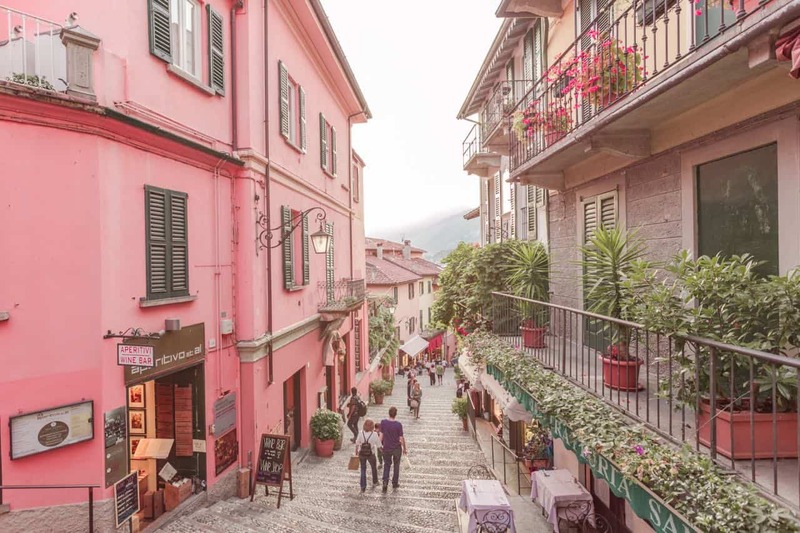 It’s super charming but not quite as crowded and would make a great base for your Lake Como travels. 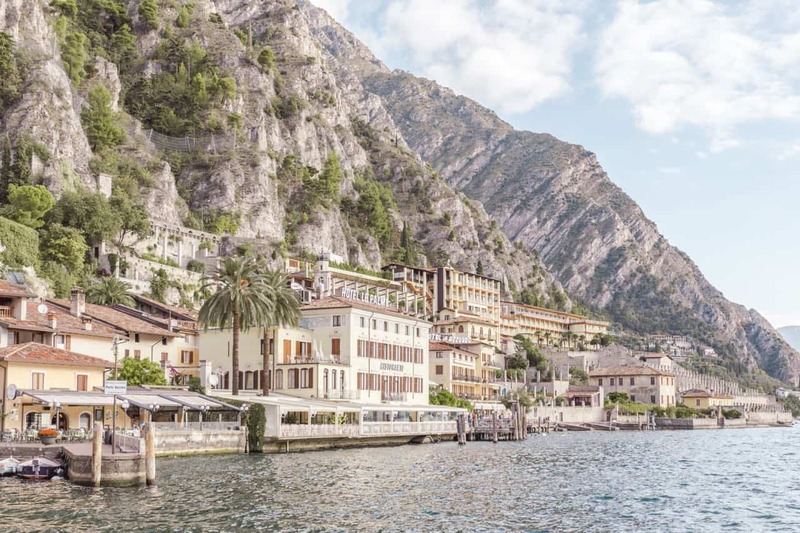 Nearby towns include Lecco and Menaggio; this area is super easy to explore via ferry. Sometimes this part of Italy is passed over, forgotten, but these 10 days in Italy are all about the region of Puglia and the island of Sicily. Though your flight cost might run higher than flying into Rome, you’ll appreciate the conveniency and efficiency of flying into Bari. This is where you’ll begin your travels. Puglia – You have an endless amount of options for your stay in Puglia. You can opt to stay 1 day in the city of Bari (the day you arrive) but be sure to stay in old town. Take a food tour and if you want to venture outside old town, consider a visit to the Palazzo Fizzarotti, a beautiful palace with intricate architecture and interior. Continue your Italy trip with two days spent in Ostuni. You can day trip to Alberobello, the famous white town dotted with over 1000 trulli. End the last two days in Puglia in Otranto, a beautiful town by the sea with gorgeous views. Easy day trips include the city of Lecce, a great town for history lovers. 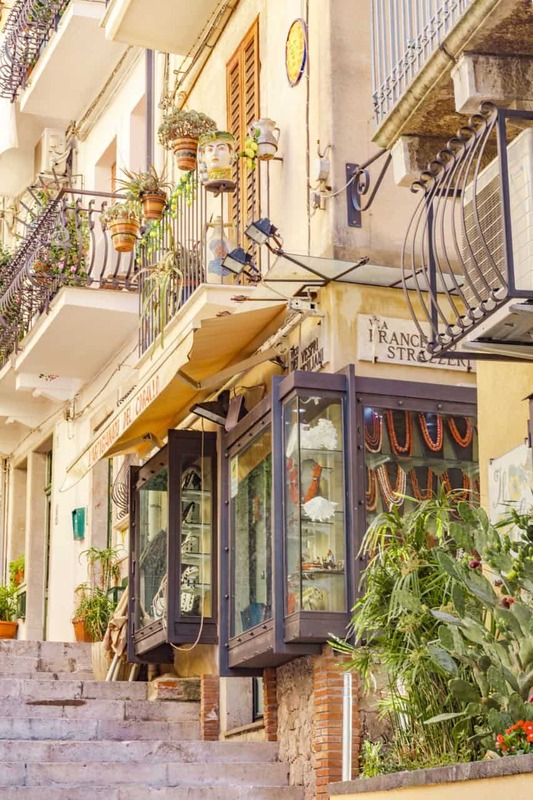 Sicily – You’ll end your 10 day Italy itinerary in this beautiful island. You can divide out your time between Taormina, Cefalù and the Aeolian Islands. 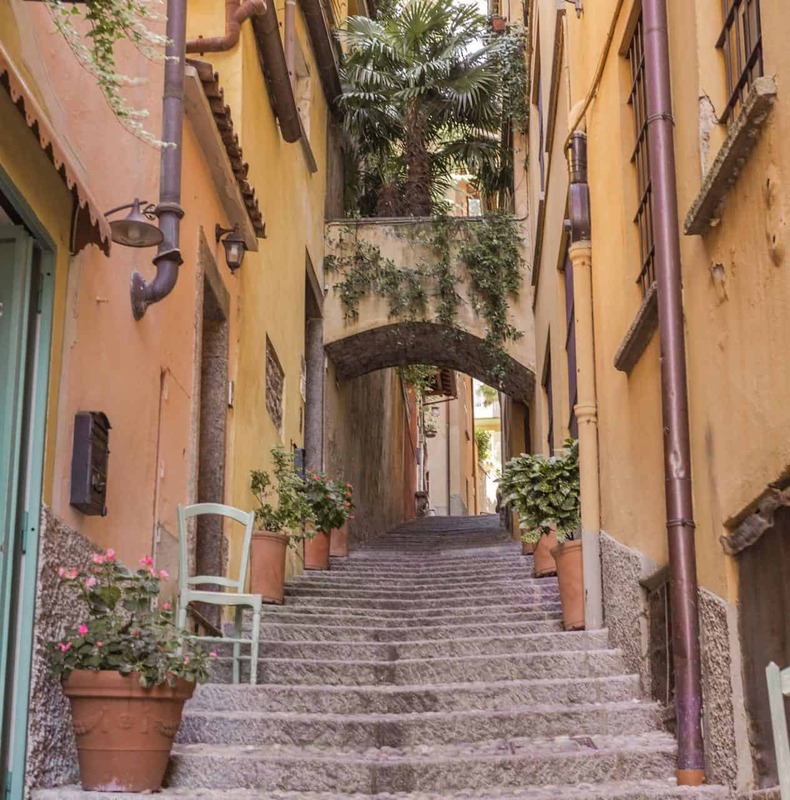 Taormina is a lovely town in Sicily with sweeping views of the sea as well as an ancient theater. You can spend 2 days here and explore the town as well as day trip out to the active volcano called Mount Etna. Days 3 and 4 will be dedicated to Cefalù and the surrounding towns. In Cefalù, you can visit the famous cathedral, Mandralisca museum, the public baths and a handful of pretty beaches. Day trips include Madonie Regional Natural Park for hiking and adventure or the Gole di Tiberio where you can take a boat ride through the pretty rocks. The last day will be spent in the Aeolian Islands; there are 7 main islands in this archipelago. Lipari is the largest with Salina coming in second. Either is a good option for staying overnight. To get there, you’ll want to take a ferry from Milazzo. Each island has something unique to offer but some of the top highlights are the thermal mud baths in Vulcano, hiking trails and snorkeling. If you want to explore all the islands in the archipelago, considering renting a boat for a day. If you don’t want to spend the night on the islands, you can do 3 days in Taormina and just day trip out to the islands. Taormina is about an hour and a half away from Milazzo so assuming you get an early start, you’ll be able to see 2-3 of the islands. 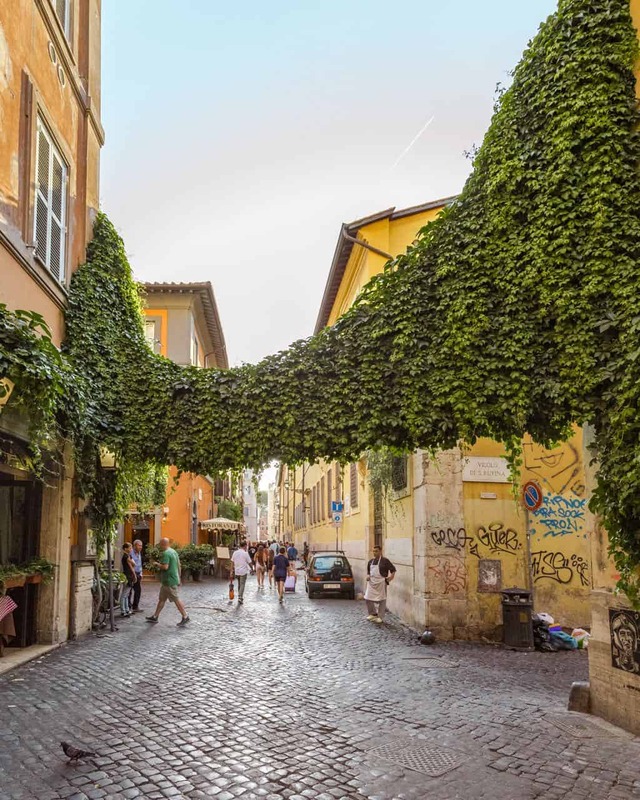 That sums up three amazing Italian itineraries; there are so many other cities and villages in Italy that you can visit that aren’t covered here but these itineraries are a great place to start in your love quest with Italy. Depending on the time of year you visit Italy and which city you’re in, you’ll have a slightly different packing list. If you’re visiting northern Italy during fall and winter, you’ll want to make sure you have clothing that can withstand the cold. In fact, some regions in Italy receive quite a bit of snow. On the other hand, summer months bring hot temperatures and unforgiving sunlight. The best way to plan is to check the weather before you go to see what temperatures you’ll encounter. Either way, here’s a general guide to packing for your trip. Wide-legged pants – These are a great option if you aren’t a fan of dresses. Jeans are also great especially if the temperature isn’t terribly hot. Dresses – These are my go-to during summer travels; pack cotton dresses for the hottest of days. Sunglasses – Bring an extra pair in case you lose one! Jacket/Coat – Depending on what time of year you visit, you’ll always want to pack a jacket. Summer evenings sometimes get chilly and winter days are cold. Comfortable shoes – Some people are skilled at wearing heels on cobblestone streets but I am not one of them. I always advise people to bring comfortable shoes. There are so many stylish sneakers today that there’s no excuse not to. If you love a little height on your shoes, pack a pair of platforms or wedges. Euros – If you’re going to be visiting small villages, make sure you bring cash. Some places do not accept credit cards and you may have a hard time finding an ATM. Boater hats/beanies – Hats are a must in every season. Felt hats and beanies are great for fall and winter while boater hats are a favorite for summer. Swim gear – A few of these itineraries include coastal towns so bring all your swimsuits, beach towels, sunscreen and any other beach-y items. Reusable water bottle – It’s convenient to travel with a reusable water bottle as it cuts down on plastic waste and saves you money. And surprisingly, Italy has quite a few public fountains/places where you can refill your bottle even in big cities like Rome. It’s always a challenge to estimate costs for another person. There are so many variables in travel including type of accommodation, food, flights, and especially what time of the year you’re visiting that it makes it difficult to give an accurate estimate for someone else. However, I will say that the average 10 day trip to Italy will cost between $1500-$2500 including airfare. Yes you can do it for cheaper if you eat pizza every night and if you stay in hostels or backpack it. And on the other hand, you can do it for twice the cost if you stay in luxury hotels the entire time and eat at $50 per person restaurants or you forget to book your car rental until the last minute and end up paying over $1000 for it (true story). This estimate is for a mix of luxury and budget and no crazy mistakes like we’ve made. This means Airbnb in some locations and fancy restaurants in others. You’ll want to note that some Italian cities are double if not triple the cost of others. The Amalfi Coast (particularly Positano), Venice, Bellagio and Cinque Terre are the most expensive overall while southern Italy, Camogli and Lake Garda are really affordable ($80 or less per night in some hotels). Food in Italy is generally cheap. A really good restaurant will run about $15 per person for a drink and entree while pizza off the street will be a few dollars. Add about $5-$10 to each calculation for restaurants in the more expensive cities. Also note that places with a view will generally be pricier just like anywhere else in the world. Flights are tricky. Sometimes we see flights for $300-400 from the USA which helps keeps cost low. So the estimates above assume flights in this price range. The estimates also depend on museums and tours you take. Some people prefer to see a museum a day while others want to wander the streets and save their money for food. Plan on an extra $20-30 per museum. Car rentals will run you anywhere from $200 for 10 days assuming you can drive manual to over a $1000 for luxury vehicles or last minute bookings. Train and bus tickets are entirely dependent on the distances traveled. As a general rule, if you’re traveling with more than 3 people, renting a car will be your cheapest option. And remember that fuel in Italy is much more expensive than fuel in the USA. *These estimates are in line with current 2019 costs. THIS IS LITERALLY THE PERFECT ITALY POST!! It gets me so pumped for my month trip there next year!! Ahhh I’m just a little jealous! Italy is so amazing! I love the idea of sharing three different itineraries! It’s such a great way for me to figure out what’s the best use of my 10-days in Italy! I would love to do the Southern Italy trip, it’s filled with places I have never visited. Great information! I love that you include options for a 1 week or 2 weeks trip. 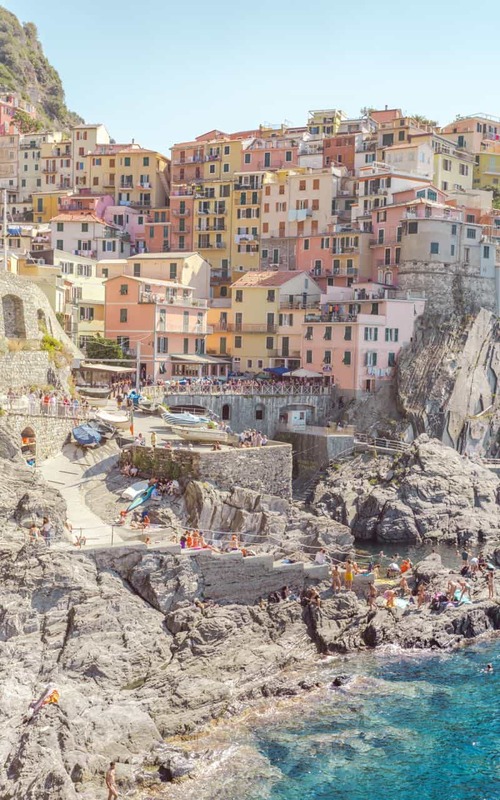 The Amalfi Coast and Tuscany are my favorites! I’ve been 4 times now and I still can’t get enough of Italy! I don’t think I’ll ever get enough of it either! Wow!! This is the most useful Italy post I have ever seen. I love that you offer multiple itineraries! Fabulous photos as well. Brava! Ahh you are so close! Slovenia looks beautiful too! This is such a great post! I haven’t been to Italy in so long, but it’s such a perfect place. So much culture and great food and drinks! I love your guide for Northern Italy. Sometimes planning the right amount of time is the hardest part. Definitely using this for my next trip! Somehow I always feel like there’s not enough time! Haha!